Meatballs are one of the ultimate comfort foods, and this is a recipe that I use at least once every 2 weeks. I have amended it and tweaked it until it became exactly what I wanted. You can use whatever cheese you prefer. The egg fact that I use 1 egg and 1 yolk might sound weird but this is how it happened. My mixture needed more eggs but I only had large and you can’t really measure half an egg so I just added the yolk and it worked, so since that day I use 1 large egg and 1 yolk. These measurements will make 8 large meatballs. Now mix all your ingredients except for the cheese, make sure everything is nice and incorporated. Add more breadcrumbs if needed. 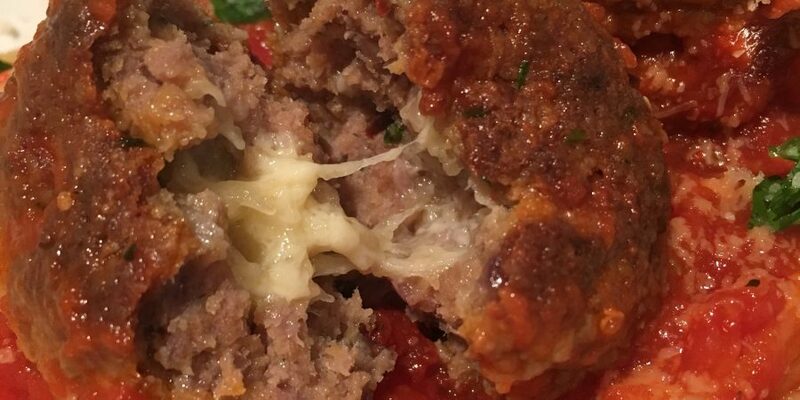 Take some of the mixture and flatten it out in your hand, then put some cheese in the middle and shape the meatball around it, squeezing it a few times in order to get rid of any little gaps that could let any cheese escape. The size is up to you, i like to make them big enough to require the use of utensils, but also not too big that having multiple on a plate will make me look like a pig. In a skillet heat up some oil of your choice, 2-3 tablespoons should be enough, and add your meatballs, make sure they are browned all all sides. Keep the heat high in order to cook the meat through. At this point add your marinara sauce and let it simmer with the meatballs until the meat is cooked through. You can also cook the sauce with the meatballs in it if you prefer, I usually just pre make the sauce in bulk to save on time. Serve with pasta of your choice or some bread, or you can even omit the sauce and have the meatballs with a salad. Another twist that I like to do with these meatballs is to use minced lamb and goats cheese, but that’s a slightly different method and I will post it another time. Haha yes! Let him cook for you and relax girl! What a lovely and awesome dish. I am now following you and hope you will have a moment to hop over and see what’s cooking on my end of the world. Romina, Thanks for joining and following. Hope you will enjoy you visits here and also participate in our new exchange kicking off on Dec 1. For some info, check out https://cookandenjoyrecipes.wordpress.com/2016/11/19/welcome-to-the-new-monthly-sharing-is-caring-recipe-exchange/ and I truly hope that you will be able to participate in this win win exchange. Absolutely delicious, thank you for posting.